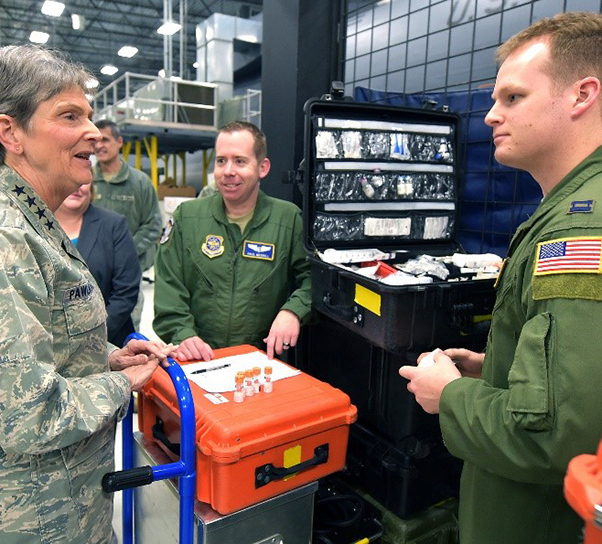 Gen. Ellen M. Pawlikowski, Air Force Materiel Command commander, discusses job responsibilities with Capts. Paul Merrill and Matthew Decker, 375th Operations Group instructors and examiners, during her tour of the U.S. Air Force School of Aerospace Medicine at Wright-Patterson Air Force Base, Ohio, Jan. 30, 2018. The general’s tour of the facility took place as part of a week-long, command-wide exercise that began Jan. 29. 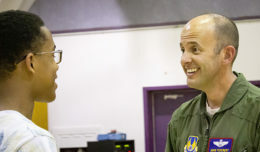 The 711th Human Performance Wing USAFSAM, is responsible for expeditionary training to flight nurses, aeromedical evacuation technicians, and Critical Care Air Transport Team military members. “No exercise is perfect, but this exercise was the perfect opportunity for us to learn,” said Gen. Ellen M. Pawlikowski, AFMC commander. The recent exercise was the first in a series of forthcoming AFMC-wide training scenarios. Each shares the goal of ensuring the command can execute its responsibilities in support of the Air Force mission to fly, fight and win in all operational situations. 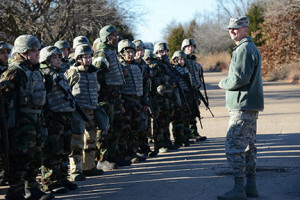 All eight of the command’s installations, in addition to Headquarters AFMC, took part in the training. * Organizations’ clearly defined ownership of processes and understanding the command and control relationships within those processes. Air Force Materiel Command Deputy Commander Maj. Gen. Warren Berry speaks to troops about the importance of training for the mission during a base training exercise at Tinker Air Force Base, Oklahoma, Jan. 31, 2018. The AFMC senior leader’s visit took place as part of a week-long, command-wide exercise that began Jan. 29. The exercise broadly provided AFMC leaders with the ability to outline and define processes used to plan and manage the transition from peacetime weapon system support to those required to surge and maintain both contingency and wartime support levels. 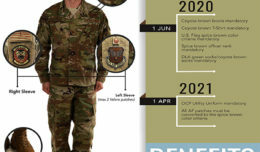 “Ultimately, we are exercising to ensure we can perform our wartime responsibilities whenever and wherever we’re called upon to do so,” Pawlikowski said. This focus on readiness aligns with the Secretary of Defense and Air Force senior leadership’s No. 1 priority of restoring full-spectrum readiness. 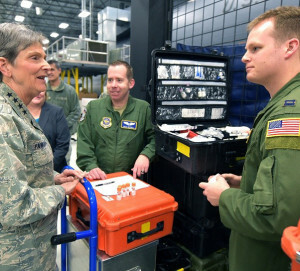 In visiting different Wright-Patterson Air Force Base facilities as part of the exercise, Pawlikowski said that she witnessed first-hand the teamwork among Airmen – both civilian and military, whether junior or more seasoned – needed to get the job done. While the general monitored the exercise from Wright-Patterson AFB, AFMC Deputy Commander Maj. Gen. Warren Berry and AFMC Command Chief Jason France observed Airmen’s participation at other AFMC installations.